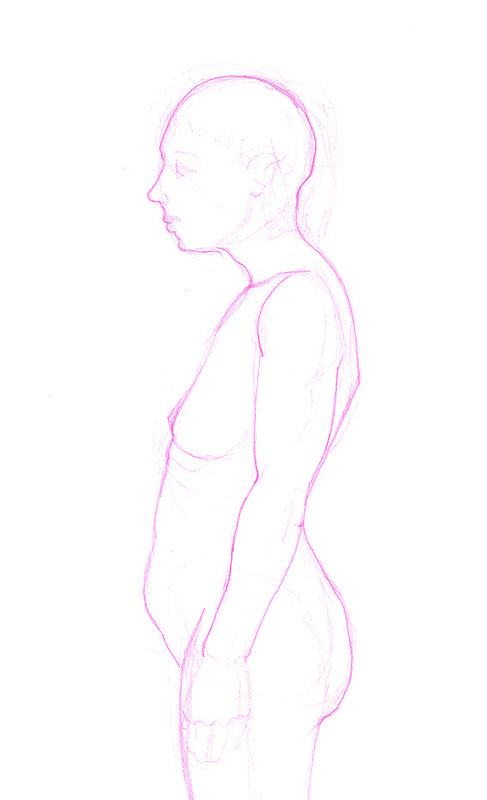 Drawing the human figure has its challenges, which is why I like the subject. 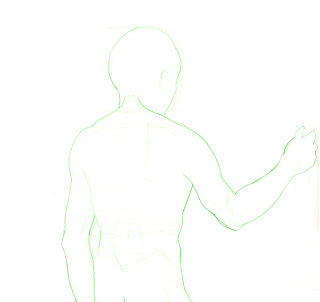 Since we are accustomed to seeing the human form and wired to understand and interpret its movement and actions, there are many elements that can go into drawing the human figure. There is plenty that can go wrong as well. 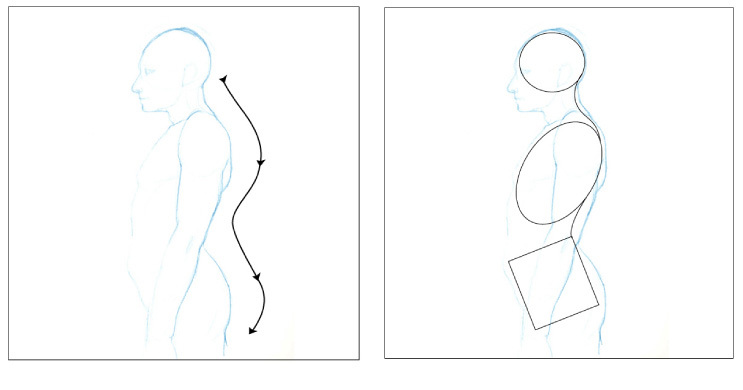 Not only do we need to evaluate the proportions and shapes the figure creates, we also need to look at the placement and location of the forms within the body. This will help give the figure we draw a sense of weight. 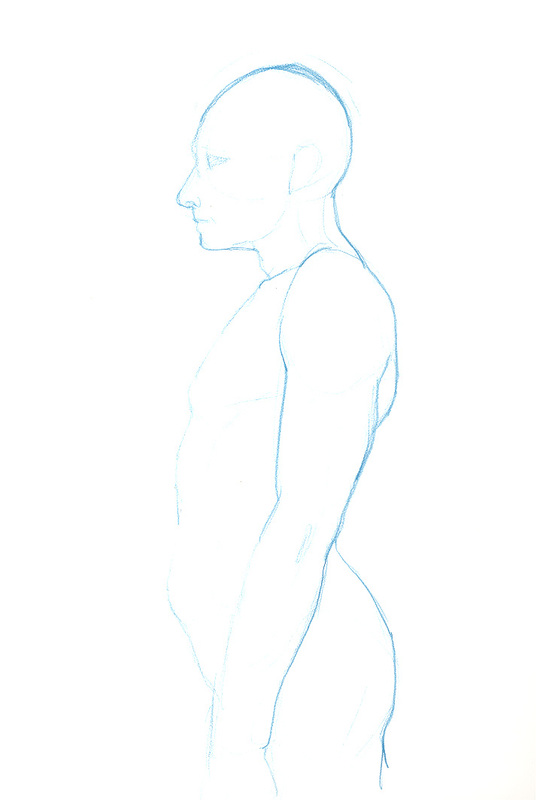 One area that has a dramatic impact on the feeling that there is weight to a figure is the how we draw the large shapes of the head and torso. 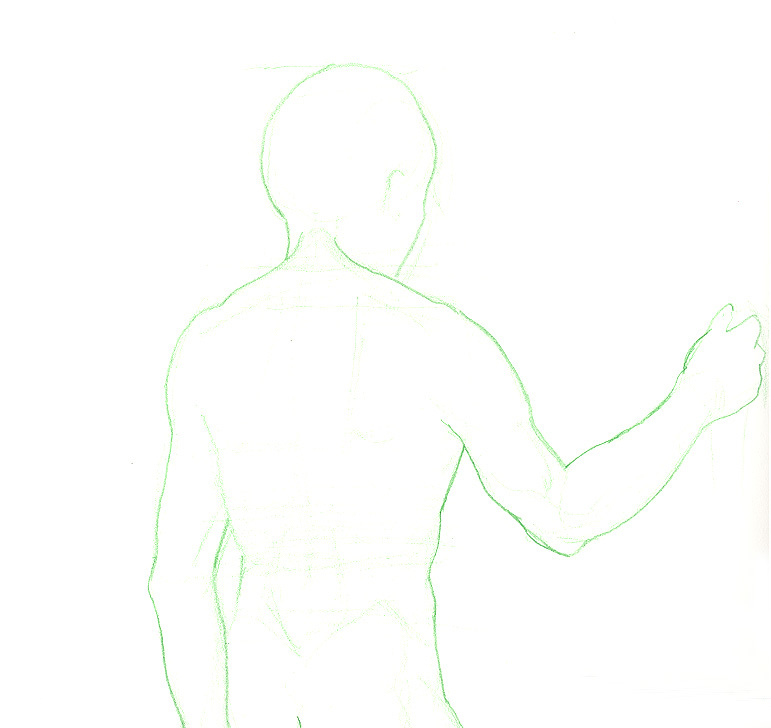 Drawing the forms to line up in a straight line will cause the figure to look stiff or stretched out. This is because the spine curves. This curve directs the direction the forms move and their location as they relate to each other. 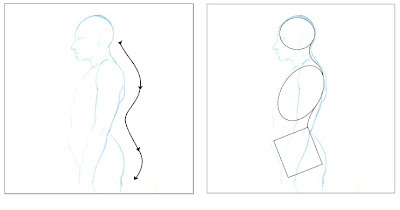 Lets take a look at how the head, ribcage, and pelvis positions relate to each other to see the curve of the torso as its surface moves vertically. 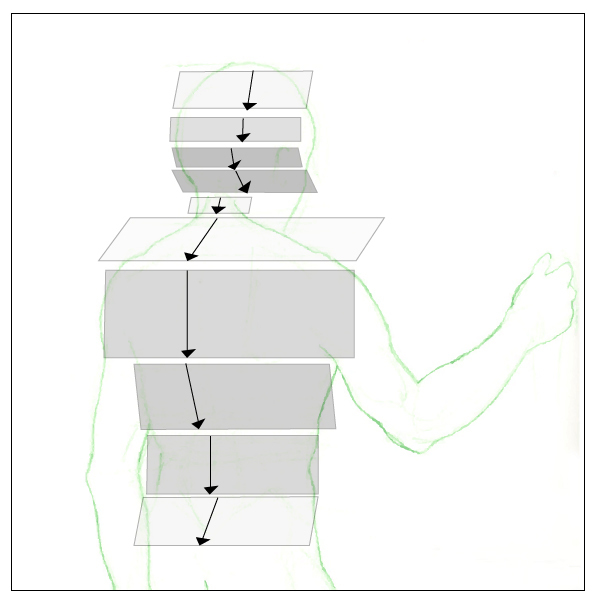 One of the things we may notice when looking at a person from the side is that the spine curves when someone is standing straight up. The back is not straight. The head is not directly over the shoulders. The ribcage tilts back and the pelvis tilts forward. Here we can see the general shape and curve of the spine and the general placement and positions of the head, ribcage, and pelvis. Notice how the head moves forward in front of the shoulders but is still behind the front of the ribcage. The pelvis tilts forward causing the hips to move forward as we stand. 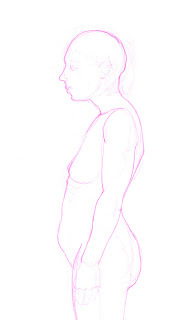 Notice the front of the hips lean forward towards the front of the ribcage. The roughly egg shaped ribcage tilts back. This places the front of the ribcage in front of the head and the scapula behind the head. 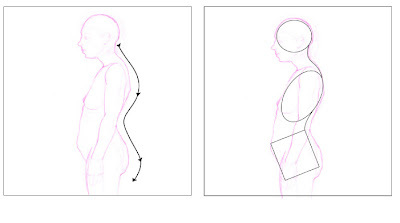 The tilts of the the ribcage and pelvis help create the curved movements of the back. From a back view, we can see the curve of the spine and the tilting of the forms by looking for the surface plane changes. 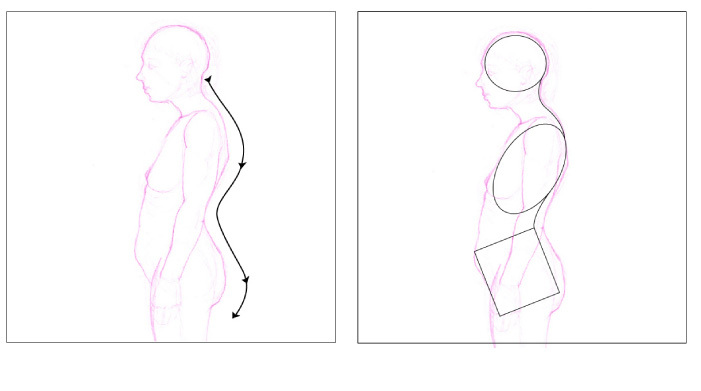 To do this, we just need to look for where the value of each area of the back gets darker. This shows us where the surface of the torso is moving away from the light and indicates the in and out curves as the back bends. 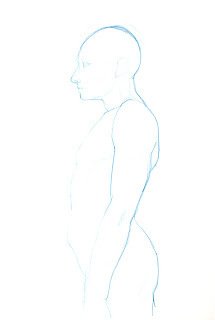 If we check the placement of the head, torso, and hips to make sure they are lined up in a way that reflects the positions of human form we see everyday, we will be able to give our drawings a sense of weight and gravity.